Despite a 2016 strategic initiative to reallocate Secretariat staff for countries with smaller (Focused) portfolios to countries with larger (Core or High Impact) portfolios, and to reduce the administrative burden on Focused portfolios, “grant management processes and procedures in Focused portfolios remain largely the same” as for the larger portfolios. This is the main finding of an audit conducted by the Global Fund’s Office of the Inspector General (OIG) on grant oversight for Focused portfolios. A report on the audit was published on 26 November 2018. In the audit report, the OIG noted that while there have been some important reallocations of Secretariat staff from small grants to Core and High Impact portfolios, and while some management processes have been streamlined, the overall management protocol of grants in Focused portfolios remains more or less the same as for grants in the Core and High Impact categories. As a result, there isn’t as much “differentiation” as was envisioned. It appears that while there was a desire to reduce the oversight for small grants, and a reduction in staff for these grants was accomplished, the actual oversight expectations did not change for the smaller grants. In essence, the Fund reduced the people but not the job. The OIG highlights that the Global Fund’s operational costs for focused portfolios is way out of proportion to the disease burden represented by those countries. Focused portfolios represent 6% of the total disease burden of countries supported by the Fund, but their management accounts for 20% of the Grants Management Division’s total personnel expenditures. While the OIG laments this reality, it suggests there is little room for improvement unless major changes are made to the Fund’s investment model and overall portfolio –– i.e. fewer grants, implementers and interventions. However, a major overhaul such as this is far beyond the scope of this audit. The Global Fund Secretariat declined our request to speak with fund portfolio managers (FPMs) for this article. The Differentiation for Impact project was meant to strengthen prior differentiation efforts, such as those emanating from the 2011 High-Level Panel recommendations in their final report entitled “Turning the Page from Emergency to Sustainability.” A wave of reorganization that occurred starting in about 2012 resulted in the establishment of country teams and separate departments for High Impact portfolios in the Grants Management Division. In 2016, as a result of the Differentiation for Impact project, three grant categories were established –– Focused, Core, and High Impact –– along with two cross-cutting classifications: challenging operating environment and transitioning portfolio (see the figure). At the beginning of the Differentiation for Impact initiative, there were 87 focused portfolios, mostly consisting of grants outside of sub-Saharan Africa. According to the OIG report, at that time the Focused portfolios accounted for about 11.6% of total Global Fund allocations, whereas by the 2017–2019 allocation cycle, they accounted for only 6% of all allocations. In the current allocation cycle, the grant application process has been differentiated. There are now three different types of grant applications based on the country context and level of allocated funding –– full review, program continuation and tailored. The tailored category is sub-divided as follows: material change, transition, challenging operating environment, and national strategic plan. The OIG found that although most funding requests from Focused portfolios are designated as “program continuation” or “tailored,” their applications are subjected to the same review and approval processes as funding requests from High Impact and Core portfolios with the same designations. This means that many relatively tiny funding requests undergo as much scrutiny as funding requests for the Global Fund’s largest portfolios. The OIG stated that the next allocation cycle will provide opportunities to further refine the access to funding processes especially as they relate to Focused portfolios. Another area for further refinement relates to grant implementation. While grants from Focused countries are only required to submit one annual progress report (as opposed to bi-annually for Core and High Impact countries), the scope and level of detail of those reports is the same as that for other countries. The OIG sees an opportunity here to reduce administrative burden through simplifying reporting for Focused portfolios. The second finding has to do with inadequate implementation of differentiated processes by country teams. The OIG noted that while guidance was supplied to country teams on the priorities and principles of differentiation for Focused portfolios, their uptake was insufficient. One example relates to performance frameworks and indicators. In this case, the guidance from management indicated that focused portfolios should have a maximum of six to eight performance indicators. Instead, the OIG said, Focused portfolios were found to have an average of nine indicators, while one-third of them had 10 or more indicators. All exceptions to the maximum number of indicators are supposed to be “discussed and approved” by the Monitoring, Evaluation, Control and Analysis team. According to the OIG, however, this has not been consistently applied. The OIG report highlights that multiple overlapping priorities can create confusion and ultimately lead to inefficient management of small portfolios. One example the report offers is that many grants from Focused countries, almost by their very nature, are transitioning away from Global Fund support or are nearing transition and, therefore, are subject to the Sustainability, Transition, and Co-Financing (STC) Policy. The policy comes with a whole set of processes that Secretariat and country-level actors must undertake. However, with their reduced staff, many Focused portfolio country teams are ill-equipped to deliver at a high level on the added processes. Moreover, country “teams” for Focused portfolios generally consist of a single person: the FPM. Focused FPMs can be responsible for as few as one and as many as eight portfolios. The report also describes an “incoherent allocation of grant management resources within Focused portfolios.” The intent of differentiation was to allocate staff and resources more in line with the size of grants in focused portfolios. But the OIG found “limited documentation” outlining a methodology for resource allocation at the grant management level. “As a result,” the OIG said, “there is currently no clear correlation between the assignment of grant management resources to countries based on either allocation, number of countries, number of active grants, average value of grants or number of principal recipients.” Thus, the wide range of countries-per-FPM is not necessarily informed by a strategic approach. The OIG report does not go into detail about the above options. But the focus on exploring and leveraging different opportunities and modalities seems to point to a concern of the OIG that some Global Fund principles, such as dual-track financing, are not appropriate for very small grants. The report described a situation in which a country has a total $2.5-million allocation, yet has two principal recipients, one each from government and civil society. In that case, and presumably others like it, fidelity to a major Global Fund operating principle — dual-track financing — limits the degree to which the management of the small grant can be engineered for efficiency. The OIG appears to encourage the Secretariat to explore flexibilities in this area and other areas like it. The agreed management action is set to be completed by the end of 2019 and is under the supervision of Mark Edington, Head of the Grant Management Division. 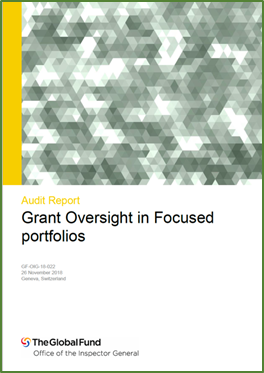 The full OIG audit report on Grant Oversight in Focused Portfolios is available on the Global Fund website.